Whoops. 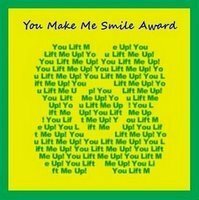 I have had this post in the works since Gill generously gave me a ‘You make me smile’ award. Then when I got back from the weekend (miserable with hayfever induced sinus pain), I found Missy and J Rae also bestowing awards on me. Hmmm… maybe everyone has just run out of bloggers to award? I finally finished the last of my marking yesterday. I think I had just about got into the swing of it, but still, I don’t harbour any desire to do it again. I spent much of yesterday trying to decide whether to sign up for NaBloPoMo after all. In the end, I went to bed early instead, thus missing the signup deadline, and I’m probably glad of that. Also glad of the extra couple of hours of sleep, as Niamh woke up three times again. In a case of “don’t count your chickens” (re. the camera purchase), my tax return arrived today, and somebody at the ATO has monumentally stuffed up, doing me out of a very substantial amount of family tax benefit. I spent an hour and a half on the phone and down at Medicare today trying to sort it out. We will get the money, but it may take another month. Grrr. I’ve signed up for another exchange even when I told myself I wouldn’t. Hardanger. Scary. Christmas is how close? 😮 And I’ve realised that I have to make Niamh a Santa Sack. Like this one of Finn’s. It’s an Ellen Maurer Stroh free design – I think I’ll use the reindeer design for Niamh. How did you decide on the title of your stitching blog? Was it random, or does it have a special meaning to you or about you? If you were to come across a sampler chart that caught your eye and appealed to you, would you or would you not stitch it if it had a morbid or “creepy” saying on it? If not, why? Do you do obligation or deadline-based stitching? Why or why not? If you do, do you tend to get in over your head and why? I have done a handful of exchanges, yes. And of course there’s the UFO round robin I’m in now. I don’t really look upon these as ‘obligation’ stitching in a negative light though. Part of the reason I join these things is to motivate myself to stitch (and more importantly, to finish!). Also, I enjoy the community aspect of them. I don’t tend to get in over my head, I usually choose only one or two at a time to join. While we’re on the topic, I recently relinquished my membership to the stitching bloggers’ exchange board. Amongst other reasons, I felt that I couldn’t really guarantee the required amount of participation while Niamh is small. There was a waiting list of people wanting membership to the board, so I hope whoever got my place enjoys it. So to all the SBEBB stitchers reading, thanks for making my stay there a good one, and… goodbye, I guess 🙂 I plan instead to take part in a few exchanges on the Rotation BB as I find the time. Woah, I’m actually answering an SBQ on the day it appeared! Which way do you stitch, i.e. do you stitch /// followed by on top, or the other way around followed by ///? Are you left- or right-handed and do you think that this affects the way that you stitch? As we all know, stitching in the winter can really be rough on the hands. What do you do to treat your hands well in the cold winter months? Do you have any suggestions for creams or soaps? Or perhaps a special regimen that you would like to share? I tried out that hemp hand cream from the Body Shop – OtherHalf likes it a lot, but it leaves me with too talc-y a feeling, so I don’t use it. I have a bunch of other creams and lotions too, but most are too scented or too greasy for my liking. Though the greasy ones are good to put on last thing at night before bed, I find. Like now! When you find yourself making a lot of mistakes in various stitching projects do you find it better to muddle your way through or do you take a brief break from stitching? If you do take a break, how long do you take? If I find tricky little counting errors, I try and fix them or at least frog them on the spot. If I suddenly realise I have a bunch of frogging to do (the sort that usually stems from one particular error), I usually set it aside for a day or so later when I’ve got a cooler head. If I keep making errors every time I pick a piece up – like recently happened with Dragonfly Jewels, then I put it away and work on something else for awhile. Or even better, do something else for awhile. Day three of my October challenge, and I’m already resorting to memes! Ha, not really, but Erin tagged me, so who am I to refuse her?! List seven songs you are into right now. No matter what the genre, whether or not they have words, or even if they’re not any good, but they must be songs you’re really enjoying now. Post these instructions in your blog along with your seven songs. Then tag seven other people to see what they’re listening to. Like Erin, I haven’t been listening to much music of my own recently. My taste is pretty eclectic, and I love our CD collection, but it just hasn’t been getting a workout lately. We do watch Australian Idol, and cringe as they murder good songs, and I always have the radio on in the car, but in general, it’s Finn who picks the music during the day. So there you have it! Now don’t expect me to go tagging people for this, that just seems too much like work! (Besides, also like Erin, I’m also not sure I still have 7 readers left – I think you all ran away because I got too boring!) How about, if you’re reading this now, and haven’t done this meme, you consider yourself tagged. Or not. As you like. This is the most excellent thing! I pinched it from a Snowball. You too can have your bloggy word cloud printed on a t-shirt. And let me tell you, I’m seriously considering having mine printed – it could maybe, just maybe, have something to do with the ‘little love machine melanie’ in the middle there :giggle: Love it! Ugh! The heat is stifling. At least with the outside awnings down and the evaporative cooling on all day, we’ve managed to keep it about 11 degrees below the outside temperature. I even put in a couple of hours stitching on Petal Fairy. Three more hours to go before another progress pic. As I write this, the change is coming in (rather violently actually – it just dropped 10 degrees in 10 minutes), so we shall have sleep tonight! I finally got around to doing sets of progress bars in a few different colours – pink, purple and green in addition to the blue I already had. They can all be found in the ‘Progress Bars’ page, see link at top-right. If you’re desperately seeking some other colour, email me, I’ll see what I can do for you. Oh, and I’m moderating an exchange over at SBEBB – called, of all things, “Melanie’s Exchange”. Y’know, coz I’m so vain and all that :giggle: Actually it’s because I made the suggestion (I stole adopted it from the first back-tack exchange, which I watched in admiration). No one could think of a good name for the stitchers’ version of this three-way exchange, so it became mine by default. Anyway, if you’re a member of SBEBB, I hope you’ll check it out, and consider joining us, it should be a fun exchange. I lived in a few small country towns before the age of 2, and then just the one slightly larger country town until I was 18, then Melbourne, Australia, ever since. I’m so totally boring! The only O/S place I’ve been is China (well, and Hong Kong, for a stopover only). I’ve been most states in Australia though. Actually, I’m good right here thanks! About 10 minutes ago I was all set to answer “SOMEWHERE COLD!” But this change is incredible. Last week’s SBQ was more about blogging than stitching. I’ve been mulling over my answer to the question since it was posted, and have been interested to read other stitchers’ answers. Take a minute to reflect on your blog reading habits and preferences. What do you prefer to read in stitching blogs? (Progress, tips, family life, experiences, etc.) How much do you think you are influenced by other stitching bloggers? 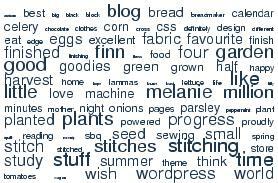 Much as I expected, many answered that they like to see mostly (or only) stitching on a stitchers blog. I figured this largely because most of the comments I get here come in response to a post where I actually show some progress on a piece, or on a happy dance post (oh so rare!). For me however, I find most stitching-only blogs don’t hold my interest very long . Yes, stitching is a big part of my life, one of my dearest pastimes, but none of us are one-dimensional. When I read a blog, I like to be able to feel I ‘know’ the person behind the blog a little better. A good deal of the blogs I read are not stitchers’ blogs. I like to people-watch, and that reflects in my online habits, I think. That said, many of the blogs I read are crafty in some way – either stitchers or knitters or otherwise. These are the people I share interests in common with, so it stands to reason that I will find them interesting. But I am most interested when the blog shares a little bit of this and a little bit of that, along with the craft reports. There are some stitching-only blogs that I check in with, and I have been inspired by some of the wonderful finishing techniques that I’ve seen lately, since discovering some of the bloggers on the SBEBB, but by and large, I want more! I like witty writing, I like a little bit of fun stuff, a little bit of family stuff, a little bit of stitching, and a lot of personality. I aspire to write this kind of blog myself, and for my one or two readers:wink: to feel they know me just that little bit more (without getting creepy, mind!) That said, I do try and keep the depressing stuff out of here. Life isn’t all happy and shiny, but I would rather my blog be a place to laugh and sing rather than a place of misery. Sometimes the misery might creep in, but most of the time it won’t. I do admire people who can share more of themselves with the whole wide Internet and gain solace from doing so, but that’s not me.